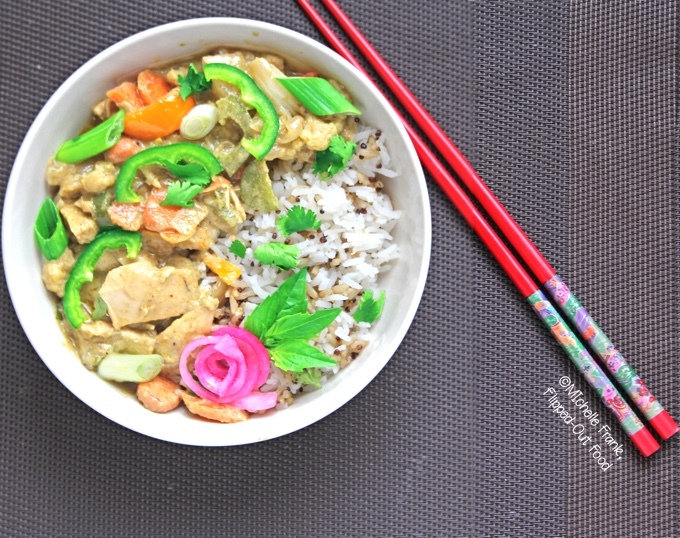 Thai Green Curry is chock-full of complex, spicy flavor and incredibly easy to make. It’s a family favorite in the Frank house. Thai Green Curry is Phil’s favorite meal, quantitatively speaking, since he asks for it about once a week. We don’t actually eat it that frequently, but it’s always on his mind. I have been making Thai Green Curry for many years. It began its life as a recipe from a cookbook called “James McNair Cooks Southeast Asian.” I had not looked at that recipe in ages—until today. I still recognize the ghost of the recipe that has become a weeknight go-to for my family, but I like to think that my version has evolved from, or perhaps become a subspecies of, that original recipe. 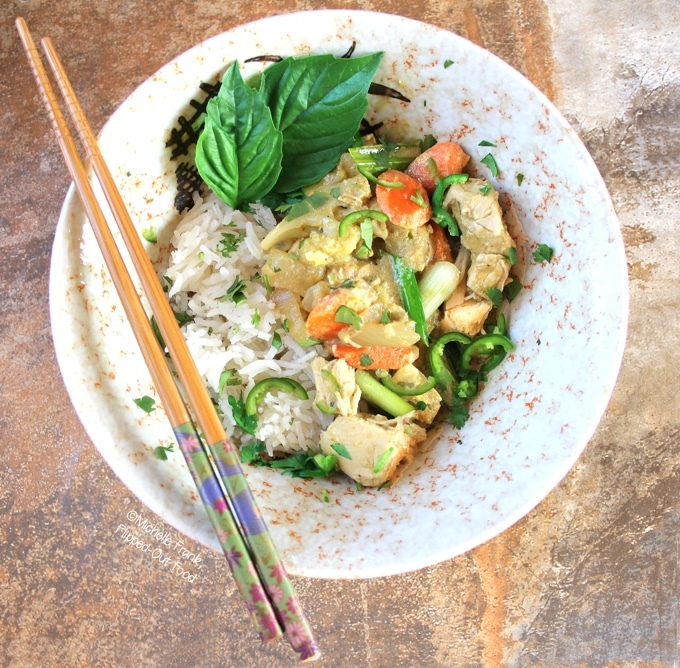 Thai Green Curry is a very healthy, flavorful dish that comes together in about 35 minutes. My family enjoys spicy food, so I have geared my recipe more toward chili-heads. But it’s easy to tone it down for the heat-averse. I used to use full-figured (so to speak) chicken thighs for this recipe. However, I’ve since found that using off-the-bone meat is much faster. Cut-up chicken thighs are now my favorite, though I have also been known to make a vegetarian version for Meatless Mondays. Thai Green Curry can be gussied up with just about any vegetable you have available. My favorites are cauliflower and green beans. I have taken to garnishing the dish with cilantro and scallions (the green part, chopped into 1-inch pieces, then sliced lengthwise into narrow strips). Thai basil is also a great choice. Most of the ingredients for Thai Green Curry are things that I keep in my pantry, fridge, or freezer. For example, coconut milk, green curry paste, fish sauce, lemon grass, and kaffir leaves. You’ll find that some of these ingredients won’t be available in a standard grocery. So, I plan a trip to my local Asian grocery about once a month to stock up (check out my favorite pantry items in my shop). Yes, you can make your own curry paste—but that takes a bit too much time to be considered Flipped-Out Food-style, weeknight cooking. Make sure to use high-quality coconut milk, and not the low-fat variety (Chaokoh is my favorite). You want the kind that has cream at the top, because this is what you will use to heat your curry paste. Don’t shake it! As I mentioned, you should be able to find everything you need for this recipe at your local Asian market. Kaffir (lime) leaves can be a bit tricky: many markets keep them in the freezer, which is the best way to store them. Here, I’ve served with a mix of quinoa and rice, using delicious easy pickled red onions as a garnish (I always seem to have some hanging out in the refrigerator since I figured out how yummy they are!). I suggest starting with 1 tablespoon of curry paste and building from there according to your heat tolerance. My husband Phil rates this among my top 5 dishes. But—by my calculation—there are upwards of twenty recipes in that category, heh-heh, so…? I hope that your family enjoys this as much as we do! Bon appétit! This is an easy recipe that comes together crazy-fast, but has a ton of flavor. You will want to have a lot of these ingredients in your pantry and freezer, so they're a good investment! Serve over jasmine or basmati rice. 2 small red Thai chiles thinly sliced—IF YOU LIKE IT HOT! Clean chicken or meat under cold, running water. Pat dry with paper towels. Heat a wok over medium heat. Swirl in the peanut oil and add the onions and carrots. Sauté for 2 minutes. Add the garlic and lemon grass; sauté for 1 minute. Move the vegetables to the sides of the wok. Scrape the cream from the top of the can of coconut milk and add to the center of the wok. Add the curry paste and gently stir into the cream. Sauté until fragrant. If using meat or chicken, add now; sauté until brown (about 5 minutes). Stir in the remaining coconut milk. Add the fish sauce, peppers, chiles, and kaffir leaves; stir to combine. Off-the-bone chicken will take approximately 20 minutes. If you use bone-in chicken breasts or thighs, plan for about 45 minutes: the chicken should be 165º F according to an instant-read thermometer, or make an incision next to the bone with a paring knife to ensure that the meat isn't pink and that the juices run clear. There are a lot of delicious flavors in that Thai Green Curry. Looks fantastic! Now this is my kind of dinner- I love anything involving curry! Yum! I just bought green curry powder and I’ve been looking for the perfect way to use it. Since your husband likes this so much, I’ll just have to give it a try! Quick and healthy got my attention. I need to start making curry more often! We love anything spicy, especially my husband! This recipe looks really good. 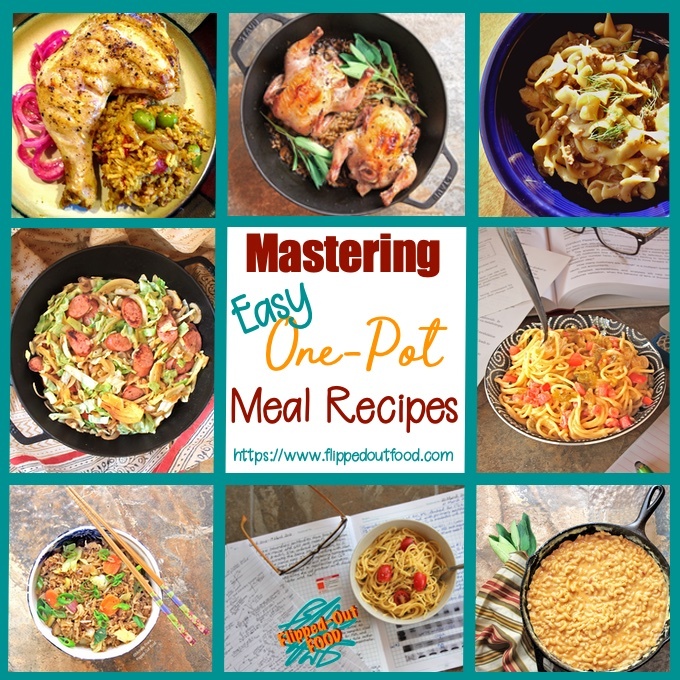 I would really like to learn how to cook more Asian dishes! I absolutely love Asian food, and Thai is probably my favorite. Thanks for stopping by! Phil sure is a lucky guy! Thanks for the great recipes Michelle. Thank you so much, Brett! I’m glad you stopped by.